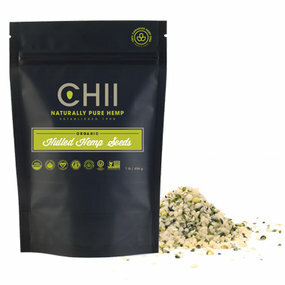 Though we have not offered hulled hemp seed in the past, we feel it is time to add it to the product list as perhaps more people would be able to consume the goodness of the perfect high protein food as the hulls, while very good for you, are sometimes a little hard to eat for some. Hulled hemp seed is exactly the same as hemp seed except that the protein content is measurably higher, not because we changed anything in the seed but because we took something away, the hulls. By removing the hulls, which by the way also removes the source of insoluble fibre and much of the mineral content, the total protein count becomes higher and the hulled seed is softer and not crunchy. One other advantage to hulled seed is that we do not have to sterilize the seed before we hull it. The seed will not sprout without the hull so by removing it, we have effectively sterilized it.